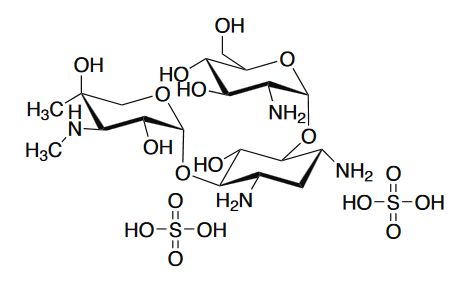 G418 also known as G-418, G418 sulfate or Geneticin is an aminoglycoside antibiotic produced by Micromonospora rhodorangea. G418 blocks polypeptide synthesis by inhibiting the elongation step in both prokaryotic and eukaryotic cells. Resistance to G418 is conferred by the Neomycin resistance gene (neo) from Tn5 encoding an aminoglycoside 3'-phosphotransferase, APH 3' II. Selection in mammalian cells is usually achieved in 3 to 7 days with concentrations ranging from 400 to 1000 µg/ml. Cells that are dividing are affected more rapidly than non-dividing cells. 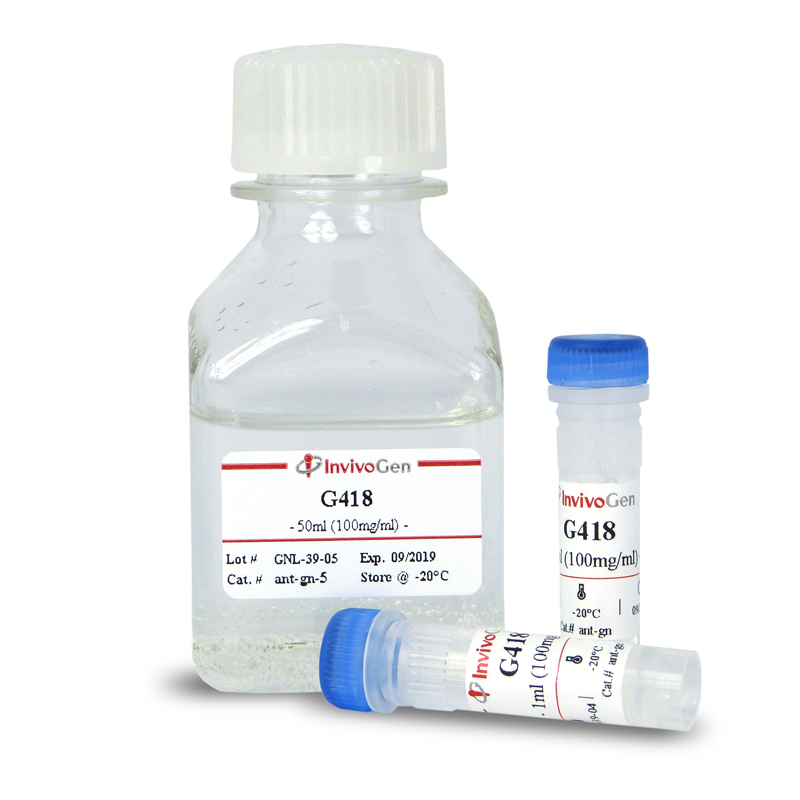 G418 is supplied as a sterile filtered solution at 100 mg/ml in HEPES buffer. G418 is shipped at room temperature. TGFβ promotes breast cancer stem cell self-renewal through an ILEI/LIFR signaling axis. Ubc7/Ube2g2 ortholog in Entamoeba histolytica: connection with the plasma membrane and phagocytosis. Peptide-specific recognition of human cytomegalovirus strains controls adaptive natural killer cells. Live cell visualization of gasdermin D-driven pyroptotic cell death. Preselection of recombinant gene integration sites enabling high transcription rates in CHO cells using alternate start codons and recombinase mediated cassette exchange. 2017 Nat Cell Biol. 19(2):120-132. Phenotypic heterogeneity of disseminated tumour cells is preset by primary tumour hypoxic microenvironments. Structure, kinetic characterization and subcellular localization of the two ribulose 5-phosphate epimerase isoenzymes from Trypanosoma cruzi. Spatial dynamics of SIRT1 and the subnuclear distribution of NADH species. Targeted nucleotide editing using hybrid prokaryotic and vertebrate adaptive immune systems. 2016 Nucleic Acids Res. 44(10):4763-84. Diverged composition and regulation of the Trypanosoma brucei origin recognition complex that mediates DNA replication initiation. Dynamic Oligomerization of Integrase Orchestrates HIV Nuclear Entry. 2016 Dev Comp Immunol. 54(1):75-88. Structurally diverse genes encode Tlr2 in rainbow trout: The conserved receptor cannot be stimulated by classical ligands to activate NF-κB in vitro. Brietzke A, Arnemo M, Gjøen T, Rebl H, Korytář T, Goldammer T, Rebl A, Seyfert HM. Virion-independent transfer of replication-competent hepatitis C virus RNA between permissive cells. Longatti A, Boyd B, Chisari FV. TBK1 controls autophagosomal engulfment of polyubiquitinated mitochondria through p62/SQSTM1 phosphorylation. Matsumoto G, Shimogori T, Hattori N, Nukina N.
Molecular mechanisms regulating impaired neurogenesis of fragile X syndrome human embryonic stem cells. Telias M, Mayshar Y, Amit A, Ben-Yosef D.
PAK-dependent STAT5 serine phosphorylation is required for BCR-ABL-induced leukemogenesis. Berger A, Hoelbl-Kovacic A, Bourgeais J, Hoefling L, Warsch W, Grundschober E, Uras IZ, Menzl I, Putz EM, Hoermann G, Schuster C, Fajmann S, Leitner E, Kubicek S, Moriggl R, Gouilleux F, Sexl V.
Anti-apoptotic Mcl-1 is essential for the development and sustained growth of acute myeloid leukemia. Toll-like receptor 3 (TLR3) signaling requires TLR4 Interactor with leucine-rich REPeats (TRIL). Infection of lymphoblastoid cell lines by Kaposi's sarcoma-associated herpesvirus: critical role of cell-associated virus.